In order to keep your dress in the best condition, it is essential you have it cleaned as soon after your big day as possible as this will allow better stain removal. We take pride in treating every dress as an individual item with the care and attention it deserves. 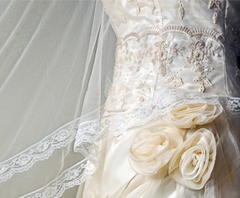 With this in mind we are dedicated to providing you with an outstanding service in the cleaning of your wedding dress. Your dress will be inspected prior to cleaning. We will then remove any stains by hand before cleaning it. Again we will inspect your dress and decide if any further treatment is necessary. 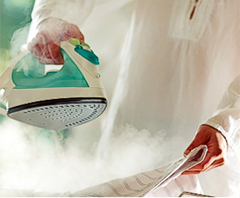 Only once we are completely satisfied that we have done the best possible job on your dress, we will finish it off by hand pressing and steaming. We cater for all wedding dresses with our specialist dry clean, spot clean and can provide cleaning for dresses labelled as 'do not dry clean'. We also clean Bridesmaid dresses, christening gowns and Prom dresses. Feel free to call for any advice. 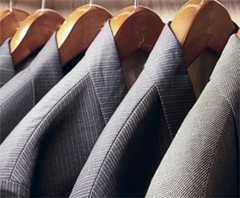 Our prices are fully inclusive, and no payment is needed until your garment is collected.